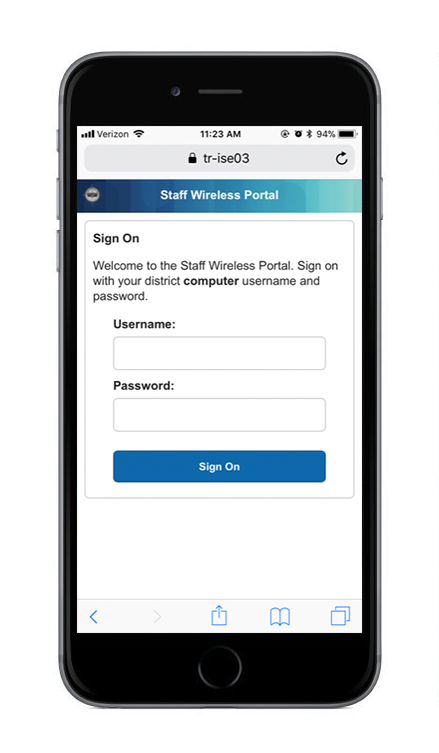 To gain access to the district wireless on your personal device, simply connect to the network "TR_Schools_Wireless" and follow the prompts on the login page that appears. MAC address contains 12 characters, with digits from 0 to 9, and letters from A to F. The letters may be either upper or lower case. Sometimes each pair of characters is separated by a colon, dash or a space. Sometimes there is no space at all. For an external wireless card, check the card to see if the MAC address is recorded on a label. If your computer has an internal wireless card, you'll have to use the operating system to find the MAC address. Open the Chromecast app on your computer. If you have set up your Chromecast recently, you'll find a shortcut to the app on your desktop. Find the MAC address at the bottom of the window. The system's MAC address is located at the bottom-left corner of the Settings menu. Your MAC address will be listed as "Wi-Fi Address". Click on the Apple Menu, and choose the Location menu item. Click on the Show menu and choose the AirPort item. The AirPort ID is your wireless MAC address. Click on the Start Menu, then select the Run item. There will be a block of information for each adapter on your computer. Look in the description field for wireless. The Physical Address for that block is your wireless MAC address. Open your Settings. You can find the Settings app on your Home Screen. Tap About. This will list information about your specific device. Scroll down until you see Wi-Fi Address. This is the MAC address for your iDevice. In a terminal window type ifconfig and return. You'll see a list of interfaces. Your wireless interface will likely be named wlan0 or wifi0. The wireless MAC address will be in the field labeled HWaddr. You can also use iwconfig to find your wireless MAC address if you have it installed. The district's BYOD wireless network allows faculty and staff to bring in authorized personal devices from home and utilize them in the classroom. The My Devices portal will allow users to register and manage these devices. To begin, locate your device's MAC address (see instructions) and log in to the portal using a valid Toms River Schools employee email and password. Why can't I get Google search results? If your BYOD device is connected to our network but you can't get Google search results, you may need to install a Securly certificate on your device. Many modern websites, including Google, use a protocol for secure communication that keeps your web activity private. (These websites have addresses that start with HTTPS instead of HTTP.) Our district web filter, Securly, cannot work properly unless it is able to view your web activity. The certificate allows Securly to decrypt the private web traffic so it can properly permit or block web content. OK. How do I do it? You will need to manually install the Securly certificate on your device. Follow the step-by-step certificate installation instructions. Download the Securly certificate file. At the Name the certificate screen, give the certificate name and press the OK button. Note: Accessing and downloading this certificate from any other browser other than Safari will result in an error. Only Safari when downloading and installing the cert will create installation prompts for the certificate. You will be prompted with a warning message that reads, "Installing this profile will change settings on your iPad." Press the Install Now button. You can exit this screen by pressing the Done button in the top right-hand corner. In the Firefox window, click on Tools and select Options from the drop down menu. Continue to "Inside of Firefox For All Systems" instructions below. In the Menu window, click on Firefox and select Preferences from the drop down menu. Click on Advanced > Certificates > View Certificates. These are the certificates that you have both private and public key to. These certificates could be used for a number of things, such as signing email, decrypting messages, accessing a website, etc. What these certificates do are defined by the key usage. These are the certificates that your computer has stored, yet does not have the private key to. These are the certificates that have been installed manually from a website and do not contain the private key. Some website are untrusted because of SSL Certificate problems. When you add an exception so that you can view these websites, it installs an SSL Certificate here. These are the Root Certificates that Firefox trusts. Any personal certificate that falls underneath any of these roots will be trusted (unless the certificate is revoked or expired). The Root certificates that come with Firefox are called Built-In Objects as they ship with a fresh install of Firefox. The list also includes any intermediate certificates that have been installed and are trusted. To install the the Securly SSL certificate in Chrome, open the Chrome browser type "chrome://settings" into the address bar and press enter. Then follow the settings below for your device. Download the Securly self-signed certificate file onto your device. Verify the SSL certificate: Issued To "*.securly.com" is installed. Download the Securly certificate file onto your device. Navigate to the location that you saved the Securly SSL certificate file to. In the Internet Explorer window, click on Tools and then Internet Options at the bottom of the drop-down menu. Note: Depending on the version of Internet Explorer, Tools could be at the top or at the top right. In the new window that appears, click on the Content tab at the top in the middle of the other tabs. Click on the Certificates button near the middle of the window. Another window appears. In this window, you can see all the certificates currently on your machine. This list of certificates also includes what is trusted by Internet Explorer. Click on the Trusted Root Certification Authorities tab and scroll down to find: "Issued To "Securly Inc."
Click on the Trusted Root Certification Authorities tab.